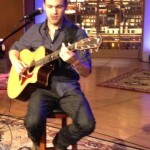 As he gets ready to celebrate the one year anniversary of the release of The World From The Side Of The Moon, Phillip Phillips stopped by the QVC studios to chat about his platinum selling album and officially announce the release of his new Live EP. The release of the Live EP will coincide with the re-release of The World From The Side Of The Moon on November 19. 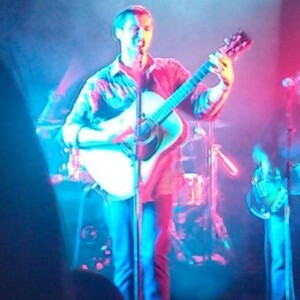 Sitting on a stool and with his trademark nervous bouncy leg, Phillips performed several songs from his album and shared stories of his early years as a young musician and his busy life after winning American Idol. The special performance took place in front a small studio audience and featured Phillips’ regular accompanying musicians Errol Cooney on guitar and Dave Eggar on cello. Together, the trio treated the audience to a beautiful and intimate acoustic set. 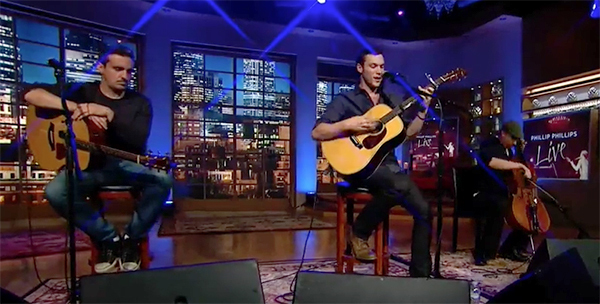 When asked about his touring with John Mayer, Phillips answered that it was “an honor to share the stage with him” but also confessed that he still gets nervous every time he plays, especially when performing “on live TV”. The visit to QVC also helped Phillips promote a special QVC Exclusive edition of the upcoming Live EP, featuring 5 songs (two more than the regular edition) as well as exclusive signed copies of his album. The songs on the Live EP were recorded during Phillips’ summer tour in support of John Mayer. The set list for the night included “Where We Came From”, Phillips’ third single from the album, and “Take Me Away”, a song he doesn’t get to perform very often. Here’s a great review of The World From the Side of the Moon written by Cameron Black from the SoCalMusicToday, worth the Read! 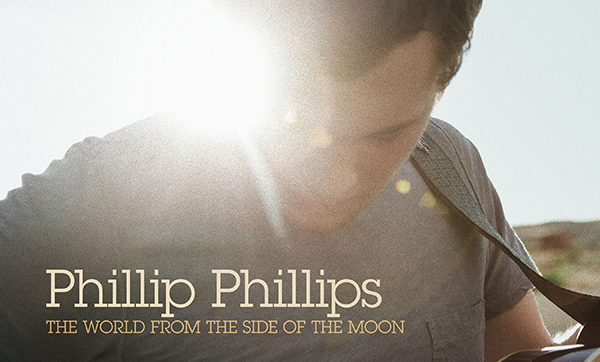 Phillip Phillips, is set to release his debut album, The World From the Side of the Moon, on November 19th. Phillips combines his impressive vocal presence with an array of backup instrumentation to arrange some fantastic songs full of great music and poignant messages. “Man on the Moon” catches your attention immediately with a twangy southern guitar. Overall, the song features Phillips’s vocal range, and really accents the rugged tone that he sings with. Featuring a banjo, violin, and saxophone solo, the song has a classic country feel to it. I would really like to hear this song played live. “Home” starts with some upbeat guitar picking and features some great harmonies to back up Phillips’s powerful voice. The song has a really positive message, “know you’re not alone, I’m gonna make this place your home.” I’m really happy to see bands today performing songs with messages of hope and comradery. The simplistic nature of this song, featuring drums, strumming guitar, and an impressive backup vocal section, will make this song undoubtedly successful to today’s happy soul. “Gone, Gone, Gone” is a very sentimental song both vocally and in its musical arrangement. Phillips demonstrates his ability to evoke certain emotions in his listener by having this song build on itself with intense dynamics, a wide array of backup instrumentation, and a moving chorus featuring a brass section and spirituous backup vocals. I’m really impressed at the number of parts that were written into this song. “Hold On” is another passionate song featuring dramatic rhythm changes and Phillips’s dynamic singing range. This song has a great groove to it, and is driven by a constant, simple kick drum. The contrast between the verses and chorus are what stand out in “Hold On”. It’s refreshing to hear so many instrumental breakdowns and featured non-vocal parts in these songs because it indicates that not only is Phillip Phillips a talented singer, but he is a passionate musician, as well. “Tell Me A Story” has a very Mumford & Sons feel to it in regards the timing and where Phillips sits in his vocals. The chorus accentuates his vocal range and sends him from a low, soothing tone to a higher, passionate tone. “Tell Me A Story” is a song you can get lost in. It’s full of space, and while the song has a lot of parts to it, they all complement each other and fit together to provide a very reflective ambiance. “Where We Came From” changes up the mood of the album. The song is full of a certain attitude from the start, with blues accents from the strings and guitar to give “Where We Came From” a distinct flavor. The chorus is surprisingly different from the verse, and changes the attitude set up in the beginning. While this song is catchy and the verse and chorus are well written, respectively, I felt the two juxtaposed into one song was a bit too much of a change for me. “Drive Me” opens with a very rock attitude. Phillips is heavily present in the song with a husky sound to his voice and well-timed accents and spacing in his delivery. There is a battered tone to his voice that gives him a sound reminiscent of Dave Matthew’s Band, especially when there is a great sax solo and a full vocal & horn section to back it up, as is present in “Drive Me”. “Wanted Is Love” has a laid back feel to it, but it is a song full of passion. The song transitions from verse to chorus very dramatically, and the lyrics reflect the sentiment made by the music. I really enjoyed the emotions this song was able to convey both lyrically and instrumentally. “Can’t Go Wrong” would definitely go on my next “Road Trip songs” mix. The song is fun and emanates a very happy feeling. Lyrically, “Can’t Go Wrong” reflects on the great feeling of being alive, “I can’t go wrong, as long as I remember where I’m from”. Stylistically, the verse has a low key, but powerful drive to it, and the chorus is in your face, but in the best way possible (and will have you singing along with it by the end). “A Fool’s Dance” emphasizes something unique about Phillip Phillip’s sound. He uses his voice as a real instrument, delivering lyrics with varied rhythms and tones to match the style of the music. The song has a very dramatic feel to it, but it is also very light, presenting a precise and fragile “dance” that we sometimes do in our lives. “So Easy” is a low-key folk rock sounding love song with a pop-infused chorus. The song sums up the album nicely, ending with an energy charged song with an overall relaxed sound. The World From the Side of the Moon is a fantastic debut album by any standards. Phillip Phillips will appeal to a wide variety of fans given his age, lyrical content, powerful vocal abilities, and extremely talented back up band. The album explores a Phillips’s ability to sing in different styles, and really tests his range. After listening to this album, I am extremely anxious to see what Phillip Phillips puts out in years to come. Lots of artists let themselves go while recording an album. It might mean growing out a beard, wearing your favorite jeans several days in a row or shaking off all your inhibitions as you put pen to paper and voice to track. 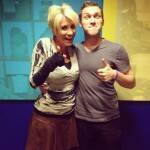 In Phillip Phillips’ case, it’s all of the above. 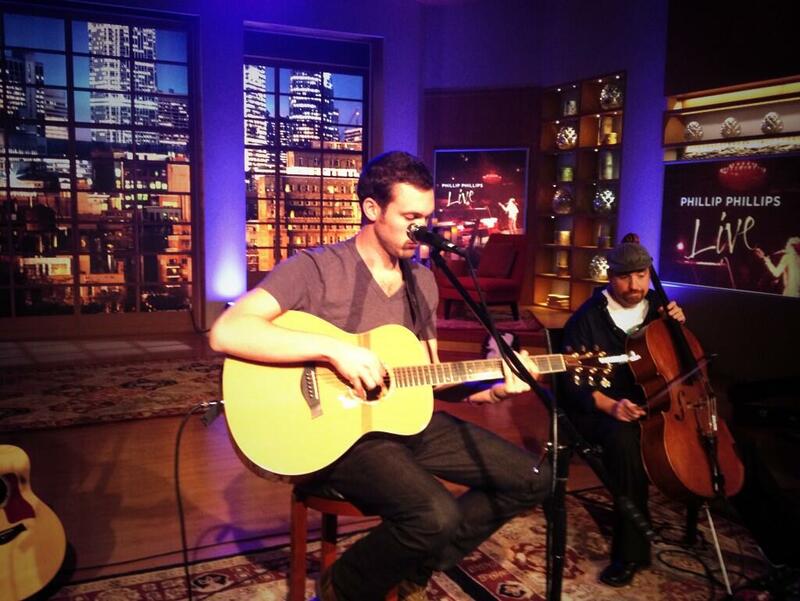 “I kind of got lazy,” Phillip Phillips tells The Hollywood Reporter of his increasingly fuzzy facial hair. Hardly, but the 22-year-old Leesburg, Georgia native may bear more of himself in other ways. Namely, the songs on his debut album, The World From the Side of the Moon, nearly all of which he wrote or co-wrote. Among Phillips’ collaborators: producer Gregg Wattenberg, who’s worked extensively with Chris Daughtry and Train, “Home” songwriters Greg Holden and Drew Pearson, who teamed up for the rollicking “Can’t Go Wrong” and his girlfriend, Hannah Blackwell. 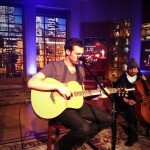 “She helped me with a song called ‘Take Me Away,’” says Phillips. “It’s not on the core album but a bonus for the Target album.” Phillips says the pining track — which includes the lines “You’re all I wanna see / All I wanna touch and feel in every way” — came from a poem Blackwell wrote about him. Phillips says it’s just one of the songs he hopes “people connect with,” but there’s plenty more material to tug on the heartstrings, including “Wanted is Love,” “A Fool’s Dance” and “Man on the Moon,” all accentuated by the sounds of strings — violins, cellos, banjos and many acoustic guitars — sometimes horns (saxophone, trumpet) and Phillips’ distinctive breathy vocal style. The singer sat down with THR to talk about the forthcoming release (due out Nov. 19) and where he sees his future. The Hollywood Reporter: First, where did the album title, The World From the Side of the Moon, come from? Phillip Phillips: It’s a lyric from the first song on the album, “Man on the Moon.” I was going through all the lyrics because I had to make decisions at a quick pace, and it kind of stuck out to me. I asked a few friends and they liked it. People might compare it to Dark Side of the Moon, but as long as I have a different album cover of the sun with my face looking down at the Earth, it’ll be okay. THR: What does it mean? I was starting to think about all I had been through, and someone gave me some DVDs of the whole [Idol] season, so I was kind of watching myself from a whole different world that no one else really knows. It’s interesting to see how it happened and so fast. That’s how I picked the title: I felt like I watched myself grow and this whole album is representing where I am. THR: Did I hear right, you recorded the whole album in three weeks? Yes. We just finished it. From first cutting acoustic guitars to last week, it was exactly three weeks. Like I said, I was pressured on time, but it kind of helped the sound. We didn’t overanalyze things or overproduce anything, we kept it raw. Great guy — just down-to-earth, and he made me feel home. We had a really good connection, he would listen and we’d figure out. It was a great learning experience. THR: You recorded in the heart of Manhattan, which is surprising for a Georgia boy. Did the city seep into the songs? I loved it! Honestly, I like New York a lot better than L.A., but I had the songs already written so it was a matter of getting in there and doing it. Now when I write I might feed off that, but I haven’t written since we got done. THR: What did you expect the recording studio experience to be like and what was it really like? I honestly didn’t know. I would record with my brother-in-law a bit at home, but nothing professional. It was interesting. Something I didn’t expect was this guy Dave Edgar played cello on almost every song on the album so I think I’ve got to get a cello player now. THR: What was the most challenging part? We would get tired because we were working like 15 hours a day, or even more. Me and Greg, we’d just look at each other all worn out and sometimes he would tell me, “We’re gonna do this, it’s gonna be alright.” That was probably the toughest part. Just getting as much done as we could because we had a time limit. THR: Greg Holden and Drew Pearson wrote “Home,” which became a huge hit for you. What was it like to work with them directly this time? We all got in a room and I showed them an idea of the guitar part, started singing the verses and we just wrote the lyrics together. It’s called “Can’t Go Wrong,” and I really like that song. It’s similar to “Home.” We all had a good time getting to know each other. This is all new for all three of us. … They understood where I was in my situation, and I understood where they were. THR: But just the fact that the song is as big as it is, they must be so stoked. They are. They were telling me it’s done great things for them. But they wrote it, like, a year ago. They didn’t expect any of this to ever happen so it’s just amazing. THR: It’s been five months since you won American Idol, is it everything you thought it would be? It’s a great experience, but it’s tough. Watching it on television on season ten, I was like, “Yeah, I could probably do that,” once it’s the real deal and you’re actually doing it, it’s not easy. You’re working 12 to 13 hour days, recording, waiting, a lot of hurry-up-and-wait. But it really helps you with the media and perfecting your performances. The worst part is you’re on live TV, because I messed up so many times on the show. I tried to pull it off and you can sneak it by people … hopefully. THR: Where do you see yourself in five or 10 years? On a stage somewhere. I’m a live guy, I like playing out so hopefully I’ll just be touring out a lot. If people will want to come see me, that would be awesome. Phillip Phillips stopped at Clevver Music to talk all about his debut album coming November 19th “The World From The Side of the Moon”. He explains what the title means, tells us his favorite song from the album, and a whole lot more. 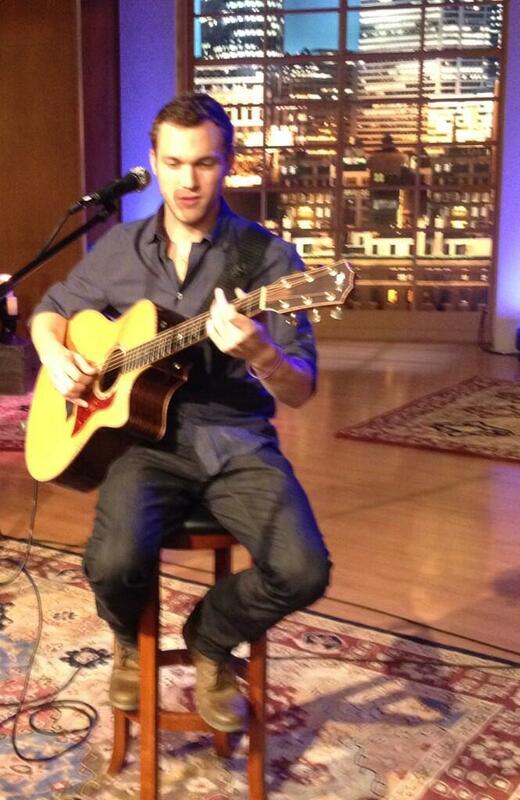 Phillip also talked about his song writing style and said, “I like to make people think”. You gotta check out the full interview below!